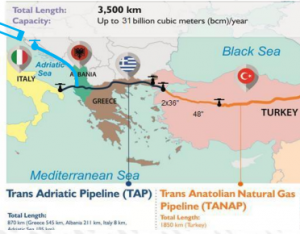 The 17th ERRA Energy Investment Conference in Antalya, Turkey contiunued on October 10 with two topics – Session III on Emerging Trends in Gas Policy and Session IV on Enhancing Security of Supply. 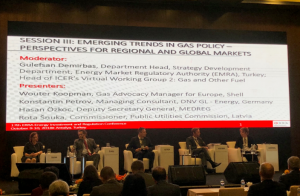 Session III opened with discussions on emerging trends in Gas Policy and perspectives for regional and global markets. The Discussion was moderated by Gulefsan Demirbas, Head of the Strategy Development Department at the Energy Market Regulatory Authority (EMRA) of Turkey. In her opening Remarks Ms. Demirbas noted that there are fundamental changes in the gas markets, with US becoming an exporter through LNG and China becoming an even larger importer of Gas. Wouter Koopman, Gas Advocacy Manager for Europe at Shell presented the effects of increased LNG availability, noting growing population, rising demand, ongoing supply, climate change mitigation and improving air quality as factors contributing to the energy challenge. 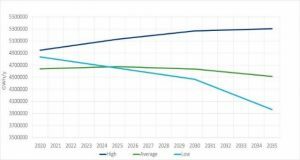 Gas will play a growing role to meet the energy challenge, with LNG being the fastest growing gas supply source. Konstantin Petrov, Managing Consultant at DNV GL, provided a presentation of the Future Role of Gas from a Regulatory Perspective. 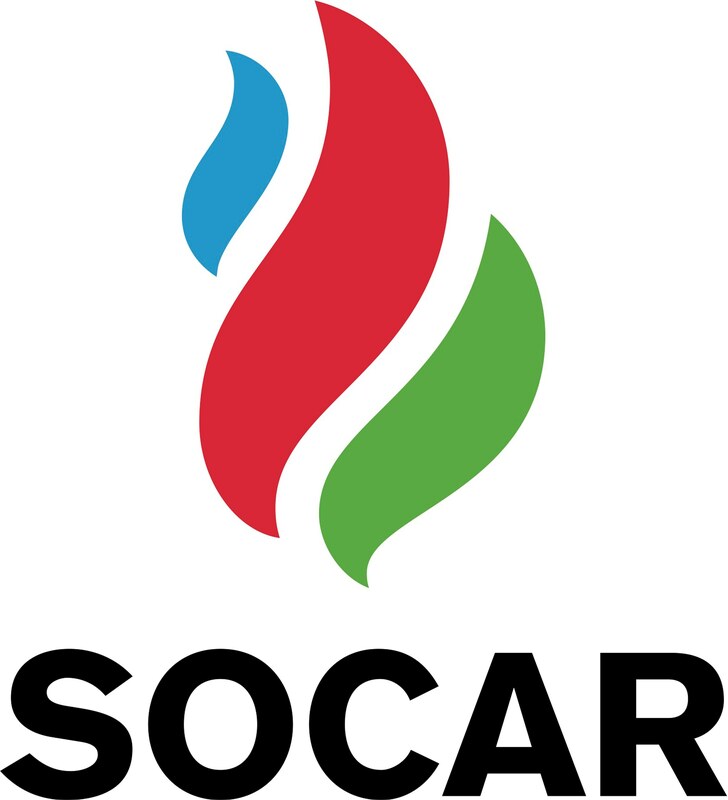 Mr. Petrov noted that the future role of gas in the case of power generation will be highly impacted by the policy on renewables support and highlighted that regulators should consider revisiting elements of the tariff design of the gas transmission networks in order to place adequate short-term capacity charges that do not discourage users to book the capacity. 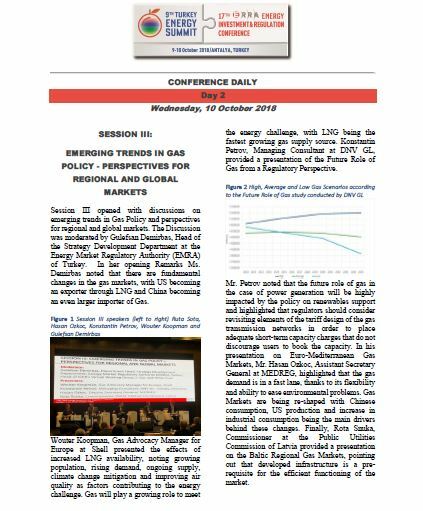 In his presentation on Euro-Mediterranean Gas Markets, Mr. Hasan Ozkoc, Assistant Secretary General at MEDREG, highlighted that the gas demand is in a fast lane, thanks to its flexibility and ability to ease environmental problems. Gas Markets are being re-shaped with Chinese consumption, US production and increase in industrial consumption being the main drivers behind these changes. Finally, Rota Snuka, Commissioner at the Public Utilities Commission of Latvia provided a presentation on the Baltic Regional Gas Markets, pointing out that developed infrastructure is a pre-requisite for the efficient functioning of the market. The panel discussion that followed was moderated by Matt Drinkwater, Senior Editor for Electricity, Gas and LNG at Argus and consisted of Aziz Camci, Chairman of Petform, Turkey, Arman Satimov, Advisor to the Chairman at KAZENERGY, Michael Thomadakis, Director of the Energy Sector at Grant Thornton and Nikola Vistica, member of the Board of Commissioners at the Croatian Energy Regulatory Agency. The discussions highlighted the importance of developing additional infrastructure and establishing a regional market in enhancing security of supply and mitigating risk. The final session of the conference covered the topic of enhancing security of supply under transitional market conditions. The session was moderated by Mr. Hammad Zafar Hundal, Country Manager at the Islamic Development Bank Group. Fayez Al Jabri, General Director for Technical Affairs at the Electricity and Co-Generation Regulatory Authority (ECRA) of Saudi Arabia presented ECRA’s Regulatory Approach to Maintaining Security of Supply, the paper which won this year’s ERRA Conference Abstract award. Haakon Reiersen Leknes, of NordPool Consulting provided a presentation on the Role of New Power Exchanges and Market Coupling to Enhance Security of Supply, highlighting that a common European power market enables the efficient use of transmission capacity by trading energy across borders, coordinates market development and levels out electricity prices. The final presentation of the session was provided by Bagdagul Kaya Caner, Head of the Group for Natural Gas Network Operation Regulations at the Energy Market Regulatory Authority (EMRA), covering the implications of organized natural gas markets on security of supply and predictability in energy markets. The session was followed by a panel discussion moderated by Matthias Finger, Professor at the Lausanne Federal Institute of Technology (EPFL) and included Mehmet Erturk, Former EMRA Vice President, Maria Manicuta, Director General for Network Access and Authorization Department at the Romanian Energy Regulatory Authority (ANRE), Giorgi Pangani, Commissioner at the Georgian National Energy and Water Supply Regulatory Commission and President of the Energy Community Regulatory Board and Dietmar Preinstorfer, Head of the international relations department at E-control Austria. The panel discussions addressed the key roles of energy sector stakeholders in security of supply. In his concluding remarks, Mart Ots, Chairman of ERRA praised progress made by member organizations to restructure sectors in a way which fosters the development of competition and encouraged regulators to have the confidence to allow markets to provide added value and welfare to customers. The next ERRA conference will take place in September 2019 in Latvia.